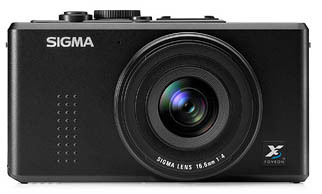 The Sigma DP1 is finally expected to be with us in April and, with a viewfinder will have a RRP of £600 (you’ll get a penny change.) Those misguided enough to buy it without the viewfinder will save £50, but are of course likely to suffer from excessive camera shake as they try to use a camera at arms length and will end up buying it later for £85. Actually given it has the equivalent of a 28mm lens, those of us accustomed to such things might find that we can get as accurate framing simply by holding it at our eye and imagining the viewfinder, a technique I’ve found to be rather useful with my similarly handicapped Fuji F31. The big advantage of the DP1 is its relatively large sensor, at 20.7×13.8mm a similar size to half-frame film, and roughly 10 times the imaging area of most compacts. The 2652×1768 pixels may seem low by current standards, but each of these records R, G and B making this roughly equivalent to a 14Mp Bayer array in a conventional sensor. Foveon sensors such as this have so far not been good at above ISO 400, and the DP1 is likely to follow in this, and the highest available speed is ISO 800. It isn’t going to be a great available light camera as the lens is a relatively slow f4. However, so long as it performs well at full aperture it will be fine in normal daylight, and the use of aspherical elements is likely to help. The MTF chart in the pdf you can download looks reasonably impressive, although the -2.3% of distortion at close range seems a little high, it can always be corrected in software for the kind of subjects where it becomes important. The -1EV vignetting – also easily corrected by software – seems fine also. Critical data missing from the spec sheet includes the shutter lag and the shot to shot time. As it can be set to manual focus, the autofocus speed isn’t too important. But assuming these are acceptable, this looks to be a good camera to carry with you, and with a weight of only 250g and a width 113.5mm, height 59.5mm and thickness of 50.3mm will sit easily in a hand held on a wrist-strap for immediate use. The 28mm lens is a good choice for general use, with the 14Mp allowing significant cropping if necessary. This entry was posted on Friday, February 15th, 2008 at 09:19 pm and is filed under Technical. You can follow any responses to this entry through the RSS 2.0 feed. You can leave a response, or trackback from your own site. Why are they making these type of cameras with no viewfinder? It seems perverse that when its more than a high end £250 compact, that they take away a facility that presumably most people want. And then make it be perched back on in a less elegant way. I have a little Canon G7, which was around £200 and has a viewfinder which links to the movement of the glass. Surely this is ‘table stakes’ for a more serious camera? Or am I missing something? I agree with you that this camera which I think appeals to a very specialist audience, all of whom are photographers should have come with a viewfinder included, although I think the accessory finder will provide a better view – the similar ones for the wide-angle Voigtlander lenses on the Leica are very good. I’m happy that with a finder directly above the lens too – built into the body it would have to be to one side or make the body considerably larger. At close range it is always better to use the monitor screen, and on cheaper cameras although I’d always use a viewfinder for most photography, ordinary camera users seem to be very reluctant to do so, preferring to wave the camera at arms length to take pics. Although I’m unable to find a rational explanation for this, it’s hardly surprising given this that manufacturers should remove the vestigial viewfinder!